India’s North Eastern Region (NER) is surrounded by five countries – Nepal, Bhutan, Bangladesh, China and Myanmar with the transboundary river basin of Ganges-BrahmaputraMeghna (GBM) covering around 1.7 million square kilometres, impacting over 620 million lives. Lying underneath the mighty Himalayas, a defining feature of the region is the many rivers that intersect the multiple aspects of livelihood, culture, tourism, trade, connectivity and local community development within this region. Given the critical importance of promoting regional cooperation on shared waterways in Eastern South Asia, the Bay of Bengal, extending upto the Indo-Pacific region, the broad contours of consensus which emerged as a possible way forward from the recent initiatives of Asian Confluence is re-imagining river development through multi-faceted regional cooperation and stepped-up connectivity. As rivers are envisioned as a metaphor for connecting lands, people, cultures and tradition spurring growth and trade related activities; special emphasis must be laid on promoting best-practices in order to protect and preserve rivers through conscious and planned endeavours. The scope for bilateral and multilateral exchange, knowledge sharing and dialogues needs to be explored in this regard. 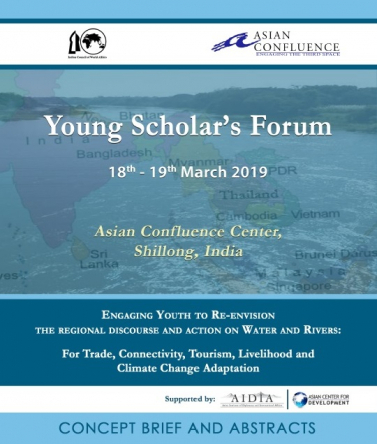 The fourth edition of Young Scholar’s Forum is based on the theme of “Engaging Youth to Reenvision the regional discourse and action on Water and Rivers : for connectivity, tourism, livelihood and climate change adaptation”.